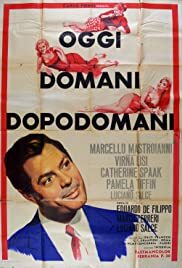 An Italian visits an odd couple and tries to sell his wife to a harem in two episodes. Mario is a Milan industrialist who is constantly testing balloons to see how much air one can take before busting. A group of men go to a villa in the French countryside where they resolve to eat themselves to death.